Select the pdf icon to the right of the title to view a pdf version of the article. Instructors at Blue Buoy Swim School in Tustin help create a new record for the world’s largest simultaneous swimming lesson. TUSTIN – It’s not yet 7 a.m. Thursday, and already 82 people – mostly children – have jumped in the swimming pool. Children splash in the cool water at Blue Buoy Swim School in Tustin as they join the world’s largest simultaneous swimming lesson and create a new Guinness World Record. In Orange County, swimmers at Blue Buoy Swim School, 1702 Nisson Road, prepare for the half-hour lesson. Instructors gave a swimming lesson to an estimated 10,000 people across the United States and in Zambia, Lebanon, Dubai and the United States Army Garrison in South Korea, including 22 pools in California. When the 7 a.m. lesson began in California, it was 10 a.m. in Florida at Disney’s Typhoon Lagoon water park; 4 p.m. in Zambia; 5 p.m. in Lebanon; 6 p.m. in Dubai and 11 p.m. in South Korea. Children learned to float, splash and hold their breath under water during the morning lesson. The youngest children practiced floating on their backs. If children fall into the water accidentally, they should know to get on their back and float, said Janet Evans, a five-time Olympic medalist and swimmer. Toddlers like to see where they are going, so it’s hard to get them to flip around and float, she said. Evans grew up in Placentia and now lives in Laguna Beach. Evans’ two children, ages 3 ½ and 9 months, both are taking swimming lessons. Children who learn to swim between ages 1 and 4 have less chance of drowning, she said. This is the first time for this record, said Blue Buoy spokeswoman Kristin Scheithauer. The World’s Largest Swimming Lesson organizers will collect the sign-in sheets and records by June 9 and submit them to the Guinness Book of World Records. Organizers expect to find out in a few weeks whether they made it into the record book. Brando Alegre, of Tustin, said his two children, 6-year-old Gillian and 10-year-old Hunter, were so excited to be part of the world record attempt that they woke up at 5 a.m.
Christi Kirzner, of Irvine, began taking her two children to swimming lessons at Blue Buoy 9 ½ years ago. “I think it’s very important living in Southern California that they’re water safe,” she said. Three-year-old Colin shivers as his mother, Amy Hsu, wraps a towel around her son. Colin was practicing floating during the swimming lesson. “It’s fantastic. It was fun. The kids were great,” said Swim for Life Foundation Executive Director Geoff Brandt, who taught his first swim lesson in 20 years during the World’s Largest Swimming Lesson attempt. Sisters Meghan and Shannon Maloney watched over the class as volunteer lifeguards. The girls are on water polo and swim teams at Santa Margarita Catholic High School in Rancho Santa Margarita and formed the Swim for Life club at their school. The swimming lesson is important, Meghan said, because children need to learn safety before they begin swimming in the summer. “I’m excited so many people want to learn to swim because that really helps to prevent drowning,” Shannon said. Published: Sept. 14, 2008 3:00 a.m.
NEWPORT BEACH As a dispatcher for the Orange County Fire Authority, Megan Soman has had her share of calls from frantic parents whose child has drowned or almost drowned in a pool. So when she heard she had a chance to support water safety by doing an ocean swim at Corona del Mar, she showed up on the sand to give it a shot. “It’s the worst kind of call, when someone calls and says ‘my kid is in the water’,” she said. Soman was joined by about 160 people for the sixth annual “Swim for Life” event, where swimmers of all ages completed a 1-mile course in the 68-degree ocean. 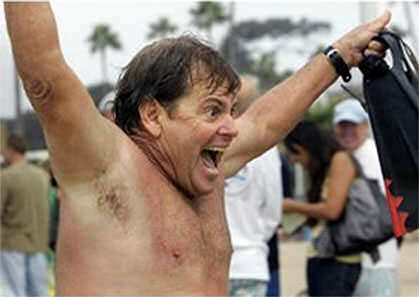 YEAAA: Johnny Johnson, Swim for Life founder and owner of the Blue Buoy swim school in Tustin, exuberantly crosses the finish at the 6th annual ocean swim. The event raised awareness for water safety. for Life event Del Mar. This year’s theme was “Drowning is Preventable”. Lezak said he was taking a break from swimming, and hasn’t been in the water for four weeks. He stayed dry during Sunday’s event. Lezak came from behind in the 4 X 100 to keep Michael Phelps in the hunt for eight gold medals. In a Sports Illustrated poll, readers called it the most memorable moment of the 2008 games. For Kim Patrick, who drove up from San Diego, the main goal of the day was to support the message of water safety. Her 2-year-old child drowned 9 years ago in the family’s swimming pool, and she’s dedicated her life to making a difference. Had she paid more attention to the importance of water safety – by putting up a barrier in the pool, teaching her child how to swim, and learning CPR – things might have been different, she said. 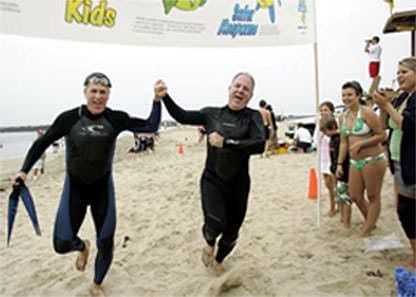 CHAMPIONS: 1976 Olympic gold Medalist Bruce Furniss, left, and Mike Wintheiser finish the Swim for Life 1.5 mile course in Corona Del Mar Sunday. SOLID GOLD: Past and present Olympic winners from left: Andrew Strenk (1968, Bruce Furniss (1976), John Mykkanen (1984) and Jason Lezak (2008) gather for a historic photo at the Swim for Life Foundations 6th annual swim. Published: June 3, 2010 Updated: 12:06 p.m.
LADERA RANCH – More than 300 Southern California residents attended the Swim for Life Foundation’s Swim for Life Safety Challenge at the Blue Buoy Swim School in Tustin on May 23. 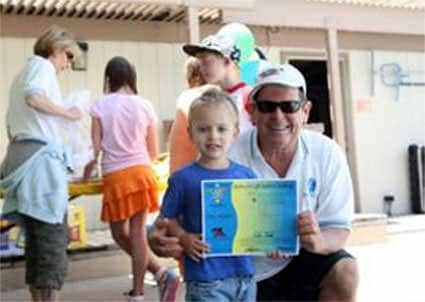 Ladera resident Cole Cook, 3, was one of around 70 kids to participate in the Swim for Life challenge. Cole and others were awarded certificates of achievement for demonstrating their various levels of swimming proficiency, from treading water to swimming distances of more than a mile. Volunteers taught the kids other swimming safety techniques, like how to stay calm if they fall into the water fully clothed. Trabuco Hills resident Olivia Romo and Dove Canyon residents Shannon Maloney, Meghan Maloney and Christine Maloney also volunteered at the challenge. Olivia, Shannon and Meghan are all part of the Santa Margarita Catholic High School Swim for Life Foundation Club. 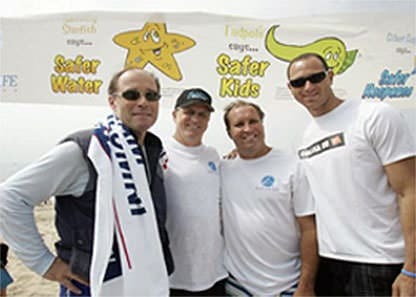 The Swim For Life Foundation is a nonprofit corporation focused on promoting safe swimming techniques and drowning prevention. For more information, visit swimforlife.org. Cole Cook, 3, of Ladera Ranch shows off his Swim For Life Safety Challenge certificate with Johnny Johnson, president and founder of the Swim For Life Foundation. Published: April 22, 2009 6:00 a.m.
Tustin-based Swim for Life Foundation and Blue Buoy Swim School conducted a water safety open house Sunday at the swim school. Kids of all ages were invited to participate in the effort to effort to reduce drowning incidents. Three-time Olympian Janet Evans helped kick off the activities. 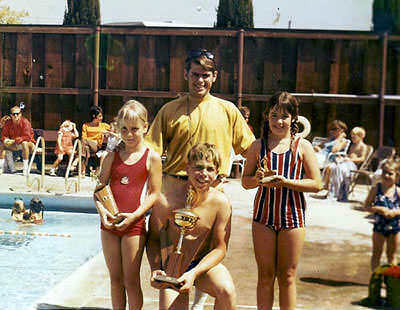 Certificates were awarded to participants when they demonstrated various swimming proficiencies. These proficiencies included young children who can jump in the water, find balance and swim back to the side of the pool; back float for 60 seconds without assistance; swim across a 20-foot pool without assistance; and swim the length of a 60-foot pool without assistance. John and Cameron Mykannen took to the pool for Sunday’s water safety event. More advanced swimmers and parents tried for a Swim for Life Challenge certificate for swimming non-stop for distances up to a mile. “The National Institute of Health just released a study showing that participation in formal swimming lessons was associated with an 88 percent reduction in the risk of drowning in children between the ages of 1 to 4,” said Johnny Johnson, Swim for Life Foundation founder and president and co-owner of Blue Buoy Swim School. “Kids Swimming for Kids” raises money for the “Safer 3,” a water safety campaign developed by the Swim for Life Foundation. It calls for “safer water” (guarding against unauthorized entry to a pool or spa by a child), “safer kids” (advocating constant adult supervision and swim lessons), and “safer response” (preparation for the possibility of a drowning incident by learning and reviewing CPR). At the local level, the Safer 3 message has been supported by the Orange County Fire Authority. The Assisteens of Tustin have been working with children with special needs at Blue Buoy Swim School weekly. The Assisteens of Tustin have been meeting weekly to teach children with special needs how to swim. The volunteers met every Sunday for two months at Blue Buoy Swim School in Tustin. The Aqua Achievers program was structured by the Assisteens and includes stroke techniques, swim races, water polo drills and free play. 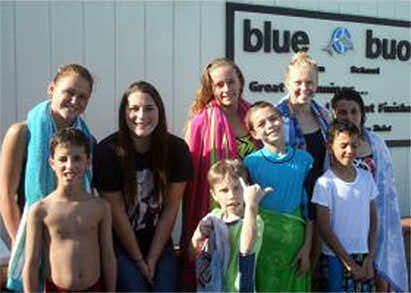 Blue Buoy Swim School has been the site of Aqua Achievers for three years. The group recently celebrated the end of the program with a barbecue at the swim school. Eleanor Lee, Katie Hungerford and Hannah Lapkin are the program co-chairs. Assisteens members Julia Sellers, from left, Hannah Lapkin, Katie Hungerford, Eleanor Lee and swimmers Noah, Ryan, Chris, Omar and Maddie attend a barbecue at Blue Buoy Swim School in Tustin. The Assisteens, through the Aqua Achievers program, have been teaching children with special needs to swim at Blue Buoy Swim School. Swimmers were up before the heat, braving cool air and choppy surf at the Swim for Life Foundation’s 10th annual ocean plunge in Corona del Mar on Sunday morning. More than 300 aquatics splashed into the water to raise awareness and money to combat childhood drowning. Drowning is the leading cause of accidental death for children ages 1-4, according to the Centers for Disease Control. “Educating people about the dangers of drowning and helping protect their children is an inspiring cause,” said Casie Shore, who has participated in several of the non-competitive Swim for Life events. 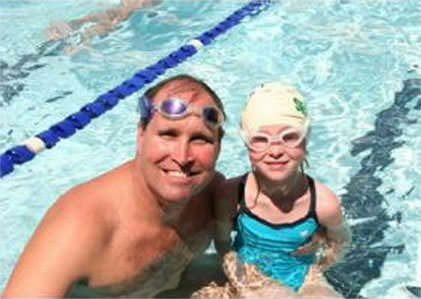 Over the past 10 years, the Tustin-based Swim for Life Foundation has raised more than $100,000 to help raise awareness of childhood drowning, foundation President Johnny Johnson said. A first timer to the event was Concordia University freshman Jessica Greenwald, who has had cerebral palsy since birth. Though an avid swimmer, she had never participated in an open-water event. “This is the next step in my swimming career,” laughed Greenwald, who, for her efforts, suffered a jellyfish sting. 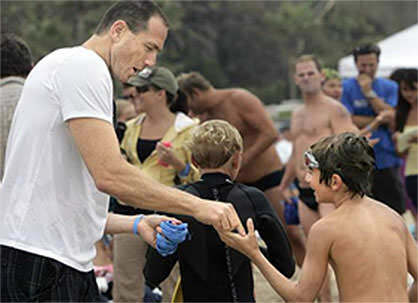 Former Olympic swimmers, including Jason Lezak, John Mykkanen, Bruce Furniss and Andrew Strenk, joined participants from around Orange County at the Swim for Life Foundation’s 10th annual ocean swim at Corona del Mar’s main beach, according to a news release. About 310 swimmers hit the water Sunday, while more than 500 spectators watched from the shore. 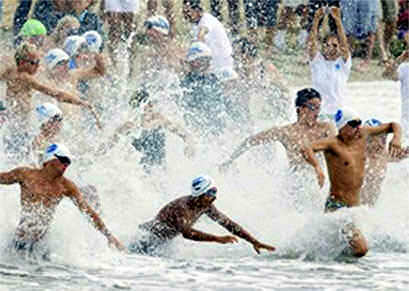 This year’s swim generated about $25,000 in support of the Tustin-based foundation’s mission. The event is an effort to promote the foundation’s “Safer 3” initiative, which aims to prevent drownings by teaching kids and their parents risk-reduction strategies around the water. According to the release, drowning is one of the leading causes of accidental death for kids younger than 5 in the United States.